Join us for the first ever Cannabis for the Cure™ WALK. Let's band together and take a stand for cannabis as the cure. We are committed to supporting researchers in furthering their efforts to find a cure and prevention for cancer and other debilitating conditions through cannabis. A portion of the proceeds will be donated to research. 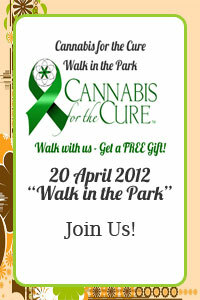 Make a $10 donation today, and receive a free "Cannabis for the Cure™" bracelet as your ticket into the WALK. The walk is only 1.3 miles and will begin promptly at 12:30pm. 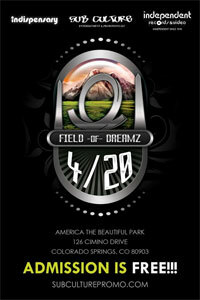 We will end our walk at America the beautiful park for the 2nd annual Field of Dreamz: Freedom Festival. 4:20 "Walk in the Park"
Join us in our walk to raise money and and awareness with Cannabis for the Cure™ 1.3 mile walk on the 20th of April. The 2nd Annual Field Of Dreamz Freedom Festival pulled together 35 local business' and over a 1,000 attendees last year! Get involved! Let's find a cure for cancer. Want to help, have fun, or make a donation? Join us today!